Yesterday, in FindMyPast or a Coffee?, I pointed out that some FindMyPast subscriptions only cost about $5 per month (not much more than a takeaway coffee). I am not an expert, and FindMyPast may change in the future, but here are my thoughts. * I have sometimes found a particular entry with a search on one site (eg, Aus/NZ) but not another (eg, UK). When I noted the country, collection and record set, then went to that country's site and that record set, I always found the entry even though it didn't appear in the initial search results. * On each FindMyPast site, look for links to 'search tips', 'video tutorials', 'help/advice' etc. * Different search strategies are required with fully indexed records (where you use name fields to search) and digitised records that have been processed with Optical Character Recognition software (where the keyword field is important). This applies particularly to the Aus/NZ site. There is a good explanation in the book The New Findmypast.com.au: Gateway to the World Collection, by Rosemary Kopittke. * At Rosemary Kopittke's talks about FindMyPast (eg, at Unlock The Past events), you often get an excellent handout explaining search strategies for each site (not just the Aus/NZ one). If you have any helpful hints about using FindMyPast, please add a comment below. The newsletter often has competitions and special offers (discounts, free pay-as-you-go credits, etc). Today's newsletter offered 20% off subscriptions if you join by 30 Nov 2013. Depending on which subscription you choose, the cost (without discounts) ranges from about $5 to $25 per month. In other words, going without one takeaway coffee per month would save you almost enough to pay for an Australia/NZ subscription. Most people reading this blog probably have British ancestry, and for you the Britain & Australia/NZ subscription may be better value. I chose a world subscription because some branches of my family were in Ireland and Canada. Not sure whether they have records that will be useful to you? Have a look at the full list (worldwide). More datasets are added each month. Note the inclusion of the British Newspaper Archive and various other digitised newspapers. If you are thinking about getting a FindMyPast subscription (or if you already have one), see my tips on using FindMyPast for genealogy. Biographical details of more than 16,000 people, many of them from overseas and other Australian States, are in these three series of historical records at Queensland State Archives - and the names and exact source references are now on FindMyPast. The hospital records usually give details similar to those on a (very informative) Queensland death certificate, plus ship of arrival, place of residence, marital status, father's present residence, and sometimes other information that is very useful for family history. Details provided by a patient at the time of admission are usually more accurate than those on a death certificate. During the early years of the Croydon gold rush, 70% of patients admitted to the local hospital were born in Britain or Ireland, and about 15% were born in Australia's southern states, especially the Victorian gold-fields. The old age pension records give information about people who received the pension and also those who were rejected. These registers give the place of residence of many people who were not on electoral rolls, including some who were not British subjects, not naturalised and thus not eligible to vote. My Web site lists (on separate pages) the names from these three indexes. You may find it more convenient to search or scroll through all 16,200 names in a combined alphabetical list. If you use FindMyPast to get exact source references, you can personally inspect the original documents at the Archives, or order a copy. You may be surprised at what you find in these records, which have allowed many people to make rapid progress with their family history. Even if you are not aware of a Queensland connection, I urge you to check the indexes. 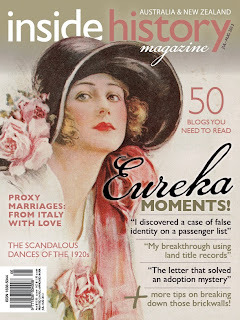 A few days ago, in False Identity and other Eureka Moments in Family History, I mentioned my article (published in Inside History magazine) about 19th century immigrants to Australia who travelled using false identities. You came to Coffs Harbour and gave us a talk some time ago... I have just read your article in Inside History regarding John and Peter Anderson travelling under false names on the Hannah Landels. John Anderson is my great grandfather... I have searched and searched and had the Oxley Library and others in Queensland look for me and we couldn't find them on the passenger list. The chances of a descendant reading that article must surely have been very small - and yet it happened, and the descendant is someone I've met. This is just amazing - and, for that descendant, a big Eureka moment! 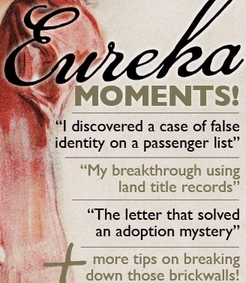 The theme of the latest edition of Inside History magazine (always a good read) is 'Eureka' moments: breaking down brick walls in family history. It includes my article about 19th century immigrants to Australia who travelled using false identities. Inside History, with features on social history and heritage and in-depth family history research advice, is Australia's leading bi-monthly magazine for people passionate about the past. 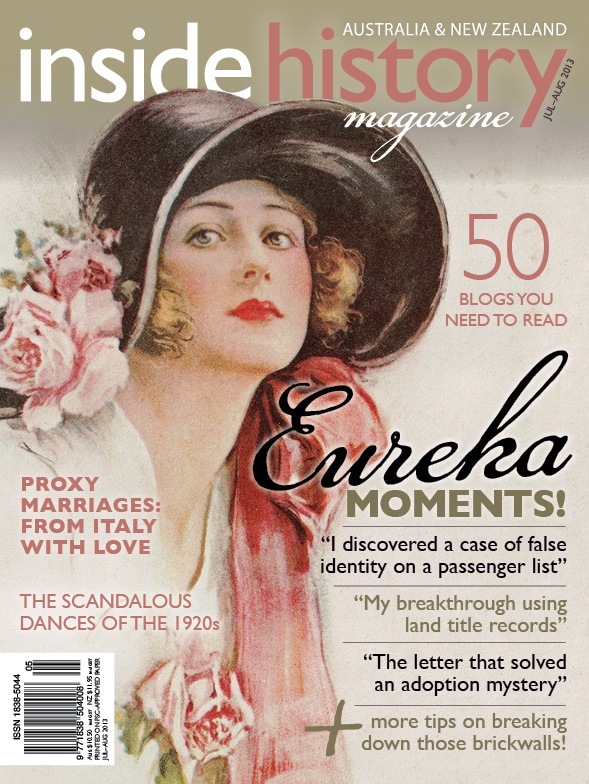 The latest edition (Jul/Aug 2013) "throws the spotlight on shipping records and a case of false identity that will have you looking at 19th-century passenger lists in a new light". It also looks at how land title records in Queensland led to the discovery of a cache of 300 family photographs; and it describes how transcribing an old letter led one reader to solve an adoption mystery from the 1930s. These are many other fascinating and informative articles in this edition. Experts help to date and identify family photographs. Read about the scandalous dances held in 1920s Sydney, and the anniversary of HMAS Australia, our first Navy flagship. There are book reviews, a travel feature on genealogy cruising, and a look at families in British India. Blogs have provided many research breakthroughs and Eureka moments for family historians, and this issue lists Inside History's Top 50 Genealogy Blogs 2013. P.S. Inside History did not publish the original source reference, which is 'Qld State Archives item ID 847100, COL/A369, 83/4753' (a Colonial Secretary's Office in-letter). A few days after I wrote this, there was a truly amazing sequel. Read about it in Genealogy Serendipity and the False Identity story. Inside History is available in newsagents and digitally, and in some public libraries.